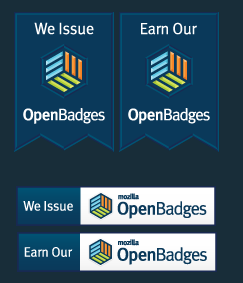 After 18 months in the darkness of beta world, Mozilla's Open Badges project stepped out into the light recently with the unveiling of Open Badges 1.0. But will the concept of organizations bestowing their own virtual endorsements for the mastery of skills hold up to critical examination from a world that, even in an information economy, demands most of its skilled workers hold a framed degree? The list of more than 600 badge-creating and -designing partners would suggest so. Especially when that list includes names familiar even to digital-phobes, like the Corporation for Public Broadcasting, multiple branches of the Smithsonian, NASA, and Disney-Pixar. Yet even Erin Knight, the Mozilla Foundation's senior director of learning, concedes it may be a while before badges resonate the same as a resume to an admissions or recruiting office, even if badges have the potential to be more authentic and certifiable. The idea behind Mozilla's project, Knight says, is to create a common currency of how badges are structured and discussed. While Mozilla can't -- nor does it want to -- control the quality of the elements required for badges listed within its project, it does require every badge to provide authentication for the organization issuing the badge and for the user receiving it, as well as a link to the criteria needed to earn it and the evidence of the learner meeting that criteria. But the first incremental step to fostering a public understanding of what badges can offer may not be a top-down, widespread knowledge of the anatomy of a badge. Instead, judging by the stories of a few of Mozilla's early partners, it may be local organizations explaining and publicizing their badge system to partner organizations they trust. The Providence After School Alliance, or PASA, in Providence, Rhode Island, has reached an agreement with the city school district that badges issued to high school students for the completion of a semester-long course will count as a high school credit in extended learning. Often, that credit isn't needed for a graduation requirement. But it does find its way onto a high school transcript as its reviewed by a college admissions office. PASA has also succeeded in convincing Rhode Island College to include a section for students to link to their individual badges to a common college application after personally visiting the school to show the development of their badges. Meanwhile, Digital On-Ramps, an initiative in Philadelphia focused on delivering career-focused training via online and mobile content, is using badges to help apply a credential to the skills learned by its users in three areas: 21st-Century skills and digital literacy; professional vocational certifications; and community leadership. Initiative organizer Lisa Nutter, the president at nonprofit youth development organization Philadelphia Academies Inc. and wife of city mayor Michael Nutter, says the badge process will only be successful with a concerted effort to explain it to community schools and businesses. “We basically have been preparing ourselves to put in a lot of energy in capacity building around this, both inside and outside of schools,” Nutter said. NASA is working on launching badges in robotics and in the STEM fields to be earned through working with NASA content and used to identify candidates for internships and jobs. The Manufacturing Institute is developing a badge to be earned by current workers and students to demonstrate skills necessary to succeed in an advanced manufacturing job or internship. The Intel Society for Science and the Public is developing badges to affirm and evaluate scientific research and tie it to professional and academic skills. Carnegie Mellon is developing badges that will eventually be issued on a curricular path that terminates in certifications recognized by computer science and STEM industries. Badges for Vets is creating a series of badges that will help offer civilian-applicable credentials for professional skills learned through military training.